Smarties, We just received word of an amazing Easter Egg hunt taking place this Saturday. What makes this different from the rest? 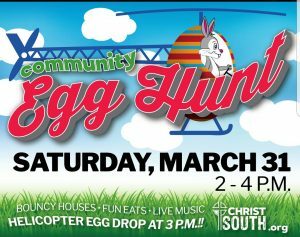 A HELICOPTER will be dropping the eggs! I don’t know about you — but, my little Smarties would think that was the coolest thing EVER! The awesomeness doesn’t stop there — they will also have bouncy houses, games and live music.